With great power comes great responsibility. Right? Or at least some clearly defined terms for how you work. As CNF grows, it’s been important to put more structure in place to guide our work, and to make these structures official, so that we can be accountable to the people and organizations that we work with. Transparency is key to the way that we work, so in the name of transparency, we recently put together a set of guidelines for our social media platforms, as well as an Endorsement Policy. These policies were created in close collaboration with John Hutchins, who is not only a member of our Board of Directors, but also acts as the American Academy of Neurology’s General Counsel. This past February, we reviewed these policies with our full Board of Directors, and now we’re sharing them with you. CNF Board of Directors. 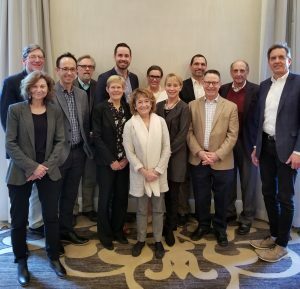 From left to right: Scott Pomeroy MD PhD, Sandra Cushner-Weinstein PT LICSW LCSW-C, Shaun Hussain MD MS, Roger Larson, Mary Zupanc MD, John Hutchins, Sue Yudovin RN MN CPNP, Amy Brin Miller MSN MA PCNS-BC, Ann Tilton MD, Stephen Peters, Thomas Langan MD, Donald Shields MD, and Matthew Collier. Not pictured, Anup Patel MD, Julie Gilbert MBA CPA, Johnathan Mink MD PhD, and Phillip Pearl MD. If you’d like CNF to consider endorsing your patient education materials, educational programming, or conferences, please read our Endorsement Policy. Likewise, for information about our social media channels, check out our Social Media Guidelines.